Describing a colour is often just an exercise in relativity as each individual’s definition/perception of a specific colour varies quite a bit. In Peru though, I’ve come across a colour where most people agree on it being the best, and most beautiful, example of blue. A lake that goes by the name of “Laguna 69” is the subject - ’69’ get’s most peoples attention for reasons probably not specifically related to trekking in mountains at high altitude but a view of this lake will have you speechless, temporarily anyway! (c.5:30-6am) departure from Huaraz to the Llanganuco Sector of Huascaran National Park. The route will take you through some picturesque villages and eventually leaving the tar road in Yungay, turning east towards the national park. During this drive, if you’re not sleeping still on the bus like most, you’ll be enjoying gorgeous views of the snow-covered peaks of Huascaran and Huandoy mountains. The south peak of Huascaran is the highest in Peru at 6,768m - on the right as you ‘face’ the mountain on this road trip. After a short breakfast stop near the park entrance, the bus will head into the park and follow the winding road up to an altitude of 3,850m where you’ll get the first big colour treat of the day, the emerald waters of Lake Chinancocha. Right above the lake as you’re taking photos, will be the north face of Huascaran mountain. This is just a taster so don’t hang around too long here, there’s another 15min drive to Cebollapampa where the trek to Laguna 69 starts off. Along the way the bus will pass another lake; Lake Orconcocha. 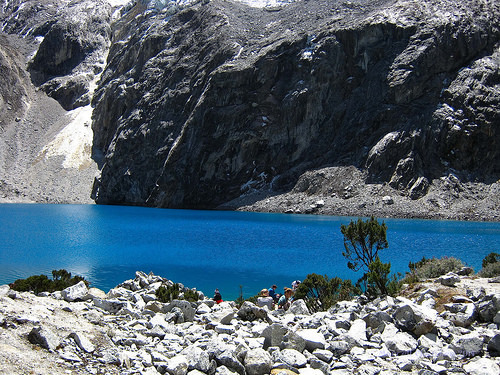 The names of these two lakes are Quechua and “cocha” means ‘lake’. “orcon” is ‘man/male’ and “chinan” is a ‘woman/female’. These names originate from a story relating to the daughter of the Inca chief Huascar after whom Huascaran mountain is named. Cebollapampa is located at 3,900m and this is where you’ll start your c.7km trek to the famous Laguna 69 whilst also ascending 725m. The name of this area, also used as base camp for the Santa Cruz trek and Pisco trek/climbs comes from plants growing on the plains that look like onions (cebolla = onion). Enjoy the views from here of Chacraraju and later Yanapaccha mountains high above you. This first section is about 3km long and ascends 200m, a reasonably easy walk but also where you could taste the first affects of high altitude trekking. Enjoy this section though along the river where you will encounter some cattle, donkeys and horse - all part of trekking in a biosphere. This isn’t distracting from the beauty of the area at all so include them in your photos. Culminating at waterfalls, the walk would’ve taken you around 45-55min depending on how your body is dealing with the altitude and exercise. Don’t forget to look back now and then to get some photos of the imposing beauty of Huascaran mountain. Walking along the zig-zag ascent of the 2nd section. The following section is a short 2km but certainly more strenuous as it zig-zags up the mountain and crosses to the nearby saddle north of the waterfalls you just passed. Once again stop now and then and enjoy the views over Cebollapampa that you’ve just ascended from; there’s some stunning photos to be had. Above you on this section, the peaks of Yanapaccha tower. Into the saddle is the last little bit of a climb, for now, and you’ll get to a little lake unofficially referred to as “Laguna 68”. views of the imposing peaks of Chacrarju. Good time for a 5min break but the wind might be chilling you to the bone so move around to the far end of the lake where you’ll be a bit more sheltered from the icy wind. In front you will be the massive shape and peaks of Chacraraju mountain. 5km completed now and you’re at an altitude of 4,400m. The final section of 2km has two parts; the first is a 15-20min flat walk to bottom of what will be the final ascent to Laguna 69. The walk across this little pampas is a good time to make up some time. At the start of the ascent there are some large rocks where you can take a final 5min break before the last push up to 200m higher. By now you’ll have seen another mountain to the left of Chacraraju, those are the peaks of Pisco - yes, named after the famous Peruvian drink. Ascending now will go even slower, for many anyway, the air is getting much thinner. Get yourself a steady pace with some short stops - as they say in East Africa, “Pole Pole” …slowly slowly! This is not all slogging as the views are drop-dead stunning all around you. Another mountain to the left of Huascaran will come into view, this is the beautiful mountain Chopicalqui - the famous logo of Paramount Pictures. In the direction you’ve come from you’ll see another couple of lakes, Lagos de Brogi which are also glacial lakes of Chacraraju. This breath-taking (pun intended) final section can take you anything from 30-60min depending on how much/little your body’s liking it. The final ridge with stunning views of the Pisco peaks. Once you get over the last little ridge, there’s a 2min flat walk before you get your first view of the bluest blue of lakes; these are the azure waters of Laguna 69. Down at the shoreline, relax and have a drink and bite to eat. Your options for photos are multitude here; over and above the standard selfies, there are some higher areas for the more energetic to get more panoramic shots from. The waterfall might have some pieces of ice coming down now and then, or like we saw the other day, a ‘small’ avalanche from one of the peaks of Chacraraju. Try not to stay later than 2pm at the most as there’s usually some weather moving in later in the afternoon plus a later walk means longer sections on the return trek in the shade, a considerably cooler experience. The final minute to the shores of Laguna 69. The crystal clear azure waters of Laguna 69. Feeling brave? Have a refreshing (very) dip - if you have dry clothes and towel with you! The trek back to Cebollapampa takes an average of 2 hours. Take care though so you don’t end up sliding down too much on the loose rocks on the trail. Once back in Huaraz, or probably on the bus already, you’ll be having a good sleep after the 14km trek to find out how blue is blue! Please note that times mentioned are an average only and is dependant on your personal physical condition and ability to adapt to the high altitudes.